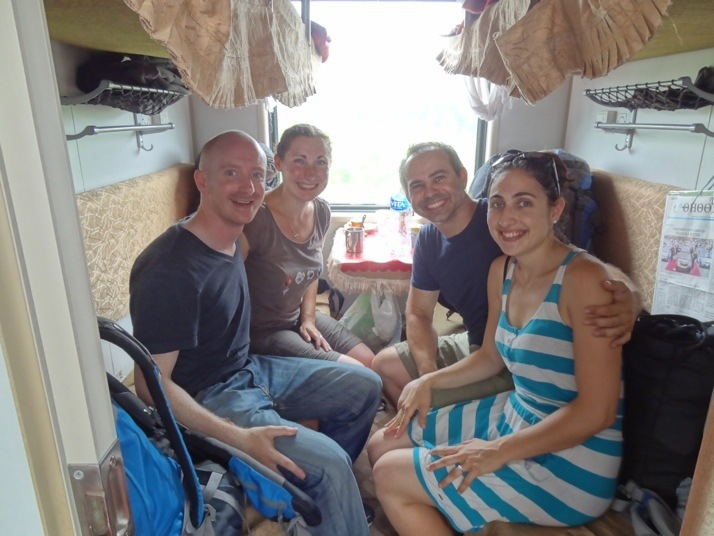 For the last 4 hours of our journey from Ulaanbaatar to Beijing, the air conditioning in our carriage was broken. This wouldn’t usually be a big problem, but northern China in August is insanely hot and humid, so that we were practically melting by the time the train pulled into the station. Were it not for the great company of our cabin mates, Renaud and Nathalie, we would not have arrived in such good cheer. 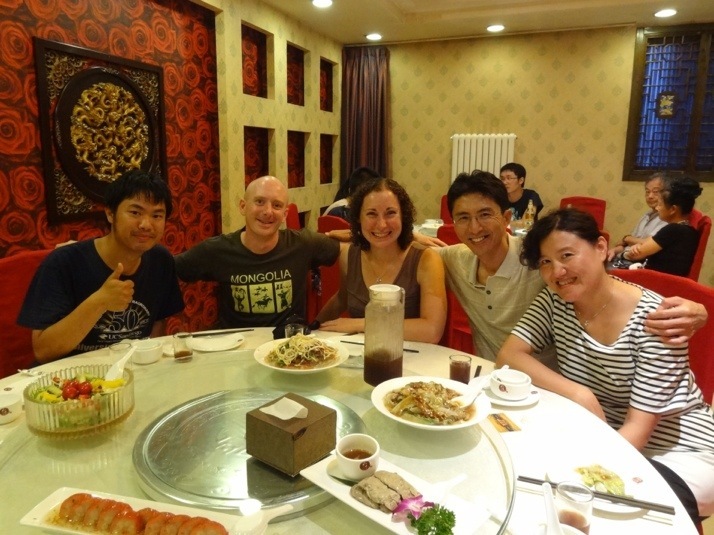 We started our visit in style with a visit to a local restaurant hosted by our Chinese friends from the Gobi tour in Mongolia, Isaac and Rebecca. Khun, another friend from the group, was also in Beijing and joined us too. So what did we eat for our first meal in Beijing? Peking duck of course! And very good it was too. We’ve had a fantastic day of exploring today and we’re really excited about all the sights, culture and food that are lined up for the coming weeks. This entry was posted in Travel and tagged China, Peking duck, train on August 12, 2013 by Julie. 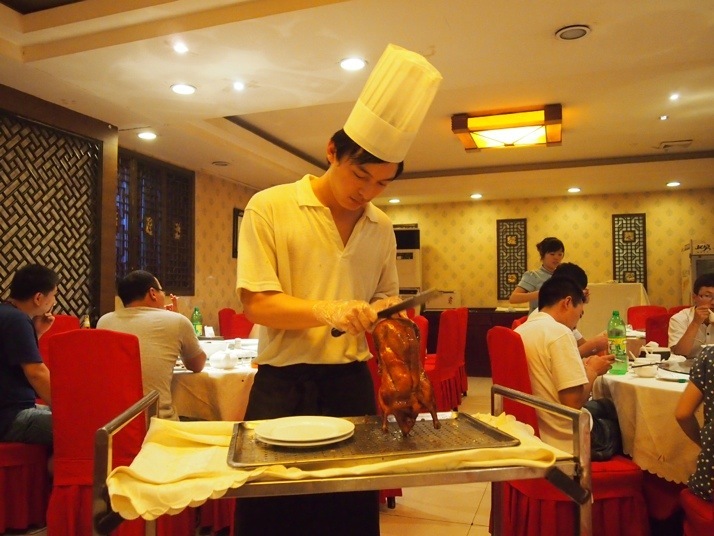 Mmm, Peking duck … how long was the train to Beijing? We’re loving the food in Beijing so far (and this is from someone who struggles to get excited about going to a Chinese restaurant at home!). The train was nearly 31 hours including a total of about 5.5 hours at the two border stations. We left at 7.15am on Saturday and arrived at 2pm on Sunday. Will you be doing the Terracotta Army ? My parents are coming out to see us next week and the Terracotta Army is on the list of places we’re going to with them. It’s one of the things that I knew I wanted to see when we first decided we would be visiting China. Thanks Mum, missing you too! Our relaxed demeanour is because the food is so good, and the traffic isn’t trying to run us down when crossing on a green man like it does in Mongolia! What a difference a couple months can make! I was so nervous it would be scorching on the train from any one of my legs between Beijing and Moscow (mid-June to mid-July), but for some reason I think we hit a cold spell! The only time I was really hot was when we had invited 6 other travellers in our cabin for a ‘dinner party’ (i.e. bring your own food and vodka) somewhere near the Urals. I didn’t even know that we had A/C until someone in the group told us we should turn it on!!! Ha!